OK, so you’ve had a banner day and shot your limit of ducks, probably with a whole bunch of bonus geese. Now what do you do? Let me walk you through everything you need to know when you have some wild ducks or geese. Processing, breaking the birds down, and how you can use pretty much everything but the quack. Ready? Here we go! Generally I don’t age waterfowl too long, because our birds tend to be fat, and duck fat goes rancid fairly fast unless you hang the birds in temperatures under 50°F. But at those temperatures, aging takes a long time. I wrote extensively on hanging game here if you want more detail. My general practice is to let the birds sit in a cool place for 1 or 2 days, often in the fridge, then pluck or skin. You can keep waterfowl in the fridge for up to a week, though. When it comes time to decide whether to skin or pluck, it depends on the bird. Sea ducks and divers shot over salt water I almost always skin. I also skin most snow geese, and spoonies (a/k/a shovelers) if their skin is orange; orange skin and fat means the birds have been eating crustaceans and will be fishy. The color is the same thing that turns a salmon’s meat orange. For step-by-step instructions on skinning, Holly and I made a video on how to skin a duck. We pluck most birds, though. There are lots of ways to pluck birds, but we use paraffin wax and a hot-cold water bath. For why you ought to consider plucking more birds, and not just waterfowl, read here. We also made a video on how to pluck a duck, too, so you can see how we do it. Our method of plucking takes about 10 to 20 minutes per bird, depending on how skilled you are or the size of the bird. Diver ducks are harder to pluck than puddle ducks, and snow geese are harder than specklebelly geese or Canadas. Once plucked or skinned, gutting is easy. I take kitchen shears and clip off the feet, then chop off the head and the second joint on the wing (I toss the wingtips). I save most of them; more on that later. Then I use the shears to chop off the tail, taking care to not damage the gizzard. I save the tail, too. After that I get some cold water running and then reach into the cavity and grab the gizzard. This usually pulls out the intestines, too. I toss the intestines and keep the gizzard. (Here is a video on how to clean the gizzard). That leaves the heart and liver. I gently reach inside and with my fingers dislodge any connective tissue holding the liver in place, then pull it and the heart out. I trim the top part of the heart off, right above the ring of white fat. For the livers, you need to remove the bile duct, which looks like a green Nyquil gel cap. I gently pinch this away from the liver under cold water without breaking it — if you break it, the bile fluid is very bitter and can spoil the liver, thus the running water. After that, a quick rinse and the duck is ready for the fridge. I pat them dry with paper towels and put them in a closed plastic container in the refrigerator for up to a week before freezing. I always will keep them at least overnight to firm up the fat. Once they’ve aged a bit in the fridge — they dry out a little, like dry-aged beef — I vacuum-seal them and freeze. Oh, and those heads and feet I’m saving? I cut out the tongues, which are used a lot in Chinese cooking. I have some special recipes for them I’ll share soon. The feet go into my duck broth. Feet have collagen, and, once you hack them up with a cleaver or kitchen shears, that collagen is released into the broth, making it thicker and richer without adding fat. Over the years, I have learned to eat pretty much everything but the quack on a duck or a goose. I have grown used to the funny looks I get from hunters who typically just cut out the breast meat on their birds. Hell, I even get funny looks from people who pluck their birds. I can’t help it. I shot these ducks. They’re dead because of me. The least I can do is not waste them. So what can you do with all these lovely bits of bird? 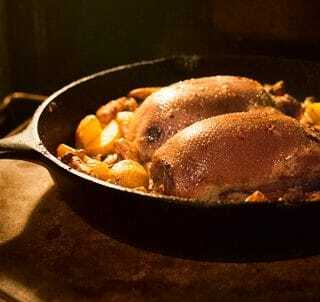 Well, we all know how lovely a perfectly cooked duck breast can be, and most of us know that duck legs are wonderful braised or made into confit. But what about the wobbly bits? Hearts can be eaten in several ways, either sliced and stir-fried, or braised for a long time. I am fond of deviled duck hearts. 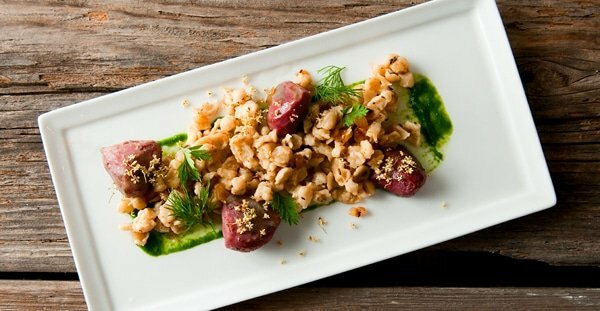 I actually make a raw, duck heart tartare that is one of the dishes I make in cooking competitions a lot — it has never failed to impress. If this is a bit much for you, use the hearts in your broth-making or add them to your ground up duck for meatballs or duck burger.
. If you hunt ducks and don’t have this book, you are missing out on a lot. Trust me. 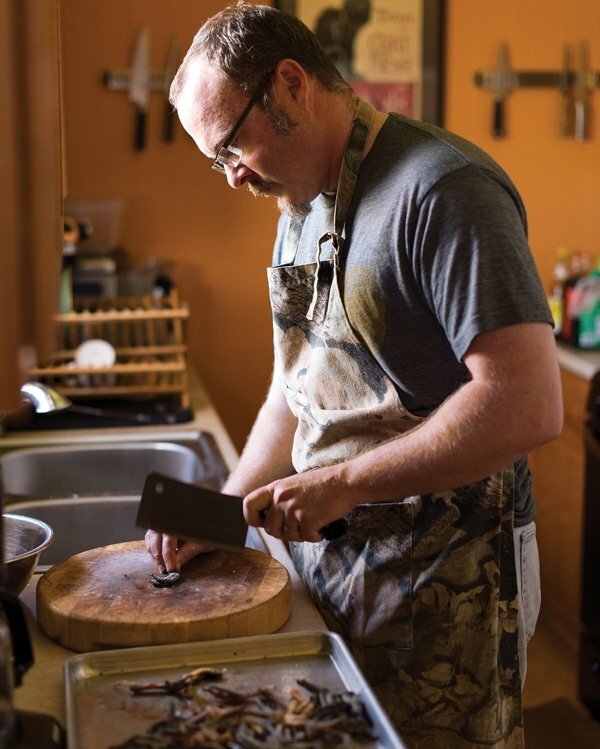 In general, gizzards need to be cooked for a long, long time. Like overnight kind of long. My favorite gizzard dish is where I “corn” the gizzards like corned beef and then cook them gently for a full day in a SousVide Supreme. It is a magical, mystical dish. You can also fry gizzards, the way they do in Montana, or add them to your duck broth. Once cleaned and ground up, they’re a great addition to sausage. I’ve actually designed a duck giblet sausage specifically for this. Livers had always been a problem for me. I don’t like the texture of liver, although I like the flavor. There is one exception, however, and that is when we get a “wild foie gras,” a liver that has grown large and fat from the bird gorging itself on rice or whatever. These livers are spectacular seared simply and served with good balsamic vinegar and salt. Normally I make duck liver ravioli; my recipe is inspired by Mario Batali’s Babbo Cookbook, which has a similar version. Livers are also excellent in pâté. I am experimenting with a couple German liver recipes — liver dumplings (leberknoedel) and a liver sausage like liverwurst. I’ll post on them when I get the recipes just right. If you happen to have a mallard, pintail or goose, you should try saving the neck skin. What I do is push out the bones and meat (they go into the stockpot), then clean the inside of the skin, pull out the windpipe and voila! You have the greatest sausage casing Nature has ever devised. I came up with this idea all by myself and was so proud of it — until I later read that those damn French have been doing it with geese for centuries. Nothing new under the sun. 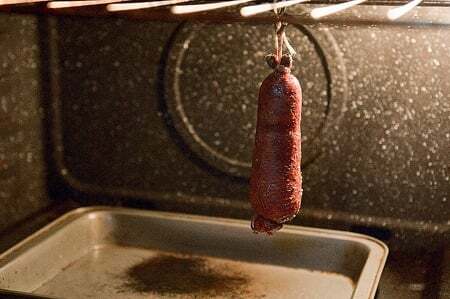 You’ll find more on making sausages with a bird’s neck here. I’m not done yet. Not by a long shot. Wild duck fat, anyone? As it happens, the tails — the Pope’s nose — on ducks and geese are typically very, very fatty. 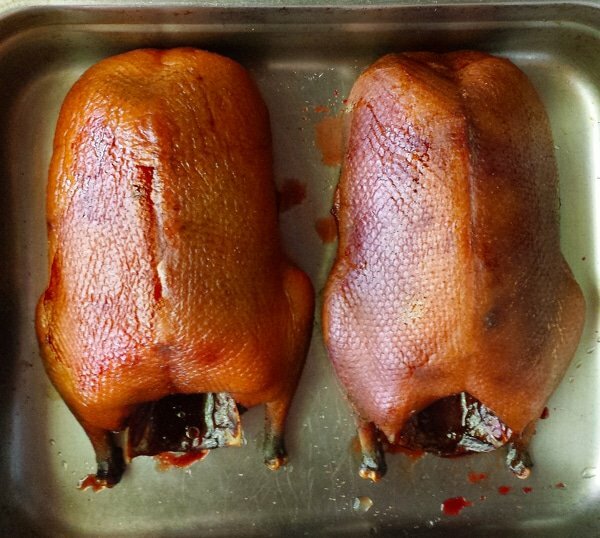 And one of the great joys of eating wild ducks is that they are among the precious few wild animals blessed with copious amounts of delicious fat; the fat under the skin is why you never skin a duck breast unless that fat is fishy-tasting. So what do I do with the various Pope’s noses? I hack them to bits and render the duck fat. I got a cup and a half from the batch of 15 ducks Holly and I shot that opening weekend back in 2008, and that is not uncommon. I once got 1/2 cup of white, sweet-tasting fat from one drake pintail. Be sure to use the tails from puddler ducks or seed-eating ducks. Don’t use divers, and be careful about spoonies — they can be fishy. My advice is to start with pintails and teal, then move to wigeon and mallards. Gadwall are up to you; if you like gadwall flavor, add them. 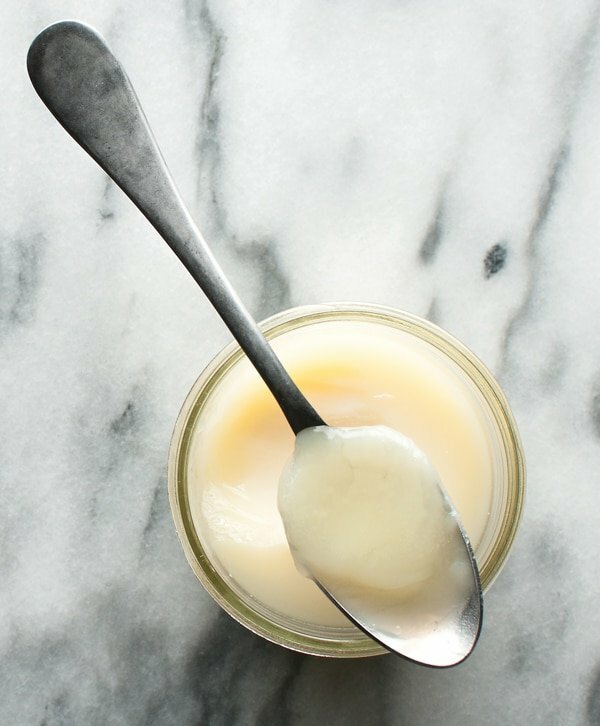 Here is how I render duck or goose fat. For those of you who do not hunt, keep in mind all this works with domestic ducks and geese just as well as it does with the birds we bring home from the marsh. And for those of you who do hunt, I hope this gives you a little inspiration to do something a little different with your birds this year. May you shoot well and lose none! 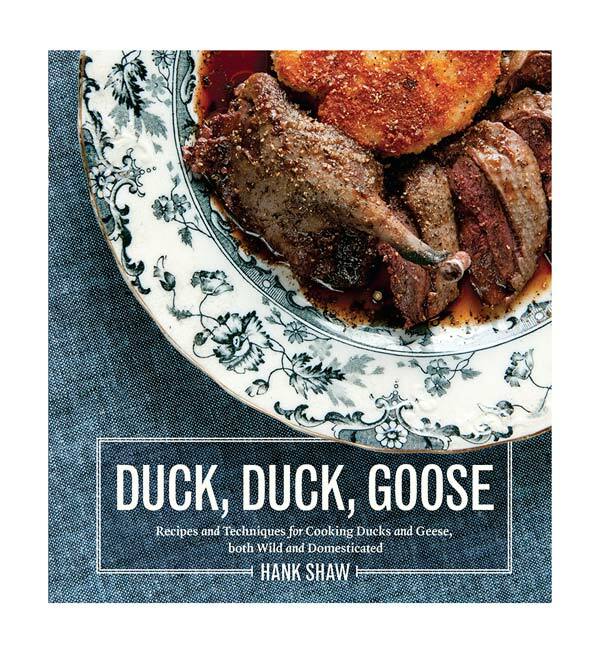 You’ll find nearly 100 recipes for ducks and geese, both wild and farmed, here on Hunter Angler Gardener Cook! First of all a huge thank you for all the insight on taking wild game from the field to the table. Quick question on temperature management from kill to processing. I prefer to hang my ducks 2-5 days guts in. I haven’t had any issues saving and eating the giblets this way. However on warmer days…say 45 and up…I get a little gun shy and often toss the innards. Many of the spots we hunt are a fair drive from home and if it starts to warm up around 10 am or so it may be 3 pm before I get them into a temperature controlled environment. To be clear on early season days (teal season) when it can be into the 80s I treat them differently, speaking to days that are into the 40s to mid 50s mostly. What, if any, food safety rules am I violating? Tom: None that I know of. You are doing pretty much what I do, although I don’t hang ducks for 5 days very often.